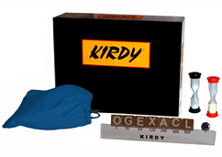 I have created the first KIRDY prototype in 1996 and it took 7 years in order to get the first edition released. Below is a quick summary of the various KIRDY’s adventure steps. - 1996: concept of the KIRDY idea, tests with players and production of the first prototype. - 1997: INPI patent, KIRDY brand registered and finalization of the French and English rules. - 1997/2002: numerous KIRDY presentations with great success. - 2002: purchase of the domain name www.kirdy.com. - 2002: first participation to a game festival in Besancon. - July 2003: participation to the FLIP in Parthenay with great success to visitors. This experience convinced me to self publish the KIRDY. - September 2003: research of suppliers and decision to produce 250 high quality units, including a limited and personalized edition of 100 units. - April 2004: KIRDY is sold in a game-specialized shop in Orleans (Euréka). They sold a total of almost 40 KIRDY. - January 2009: all 250 KIRDY have been sold and preparation of a second set within an on-going business plan. Making words from letters drawn at random is common to many word games! But add a little cunning, an element of chance, some audacity and a lot of strategy and you get KIRDY, a word game like no other word game! You can challenge your opponents, and take their points by gambling on your wits! Beware though, as the sand falls ever too quickly through the egg-timer, the pressure builds! The game starts with two letters (easy enough, see below) and becomes progressively more difficult as new letters are added. Drawing an extra letter tile after each word, the player has to find a new word, each time betting before the draw that he will be able to do so. 1. How to play: Once placed round a table, each player draws a tile to decide who goes first. The player who draws the lowest letter of the alphabet starts. Play continues clockwise. The first player draws two tiles and places them on the support, visible to all other players. He turns the black egg-timer and has one minute to make a word using the two letters, in the order in which they were drawn. The length is not important; he just has to make a word! As soon as the player arrives at a word, (as in the examples above, generally easy with only two letters to use), he announces it to the other players. This is done orally; no tile is added to the support. He can announce as soon as he is ready, he does not have to wait until the minute is up. During this minute, the other players are also thinking of a word, as they can gain points if Player 1 cannot think of one. Herein lies one of the most interesting elements of KIRDY, as all players participate in each other’s turn with the prize of winning points during another players go. If Player 1 does not find a word after 1 minute, player 2 is the first speak up if he has found one, then Player 3, then Player 4 and so on. Every player has only 5 seconds to suggest a word, if not the next player has his chance. • to carry on - (he draws a third letter, see "game" below) but he risks losing his points if he does not find a word next go. • to stop, he scores all the points in play (see "points" below). The player’s turn is over and all letters are returned to the bag. A new turn begins with Player 2 drawing two tiles and placing them on the support, in the same order as they are drawn. - Player 1 does not find a word and player 2/3/4 or 5 does: the player who finds a word scores the points accumulated by player 1 during his turn. Player 1 loses those points. Player 1’s turn is over and all letters are returned to the bag. A new turn begins with Player 2 drawing two tiles and placing them on the support, in the same order as they are drawn. - No player finds any word: Player 1 loses his accumulated points but no other player gains them. The player’s turn is over and all letters are returned to the bag. A new turn begins with Player 2 drawing two tiles and placing them on the support, in the same order as they are drawn. 2. Game: the game starts with two letters, allowing the player to score 30 points if he manages to make a word. If the player feels confident enough to continue he draws a third tile which is placed on the support following in sequence the first two. If he finds a word within one minute, he scores 60 points and he can decide to carry on for a possible 120 points with the fourth letter and 240 points if he is successful with a fifth and so on … but the risk increases with each additional letter. The player stands to lose all his points accumulated during his turn if he fails and worse still could find they are "stolen" by one of his opponents! Only the player whose turn it is decides whether to stop or carry on after each word, the trick is knowing when to gamble and when play safe. The objective is to be the first player to make 1000 points. - 1 pad "Point / Announcements"
Playing time: between 30 minutes and 45 minutes. Number of players: 2 to 5 players. Not suitable for children under 3 years old - contains small pieces. Thank you to Mr Martin Ryley who provided the KIRDY's rules English translation. © Philippe Contault, 2009. All rights reserved.